Le Cirque was one of the most famous and fancy restaurants in New York City and it finally moved to a new location and was then called Le Cirque 2000. That made Sottha Khunn a very busy man. 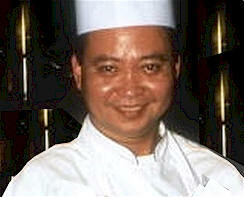 He had been a chef at Le Cirque for more than ten years. Khunn was born in Cambodia. He doesn’t like to talk about his childhood. ”That was a very long time ago,” he says sadly. Khunn’s family was torn apart when he was very young. But this sad story has a happy ending. Khunn emigrated to France in 1974 to study classical French cooking. Ten years later, a very famous chef, Daniel Boulud, invited Khunn to come to New York. Boulud wanted Khunn to be his sous-chef (the assistant to the top chef) at his Le Regence restaurant. Khunn accepted his offer, and came to the United States in 1984. Two years later, Khunn and Boulud left Le Regence and started working at Le Cirque. Boulud left Le Cirque a few years later, but Khunn stayed. Today he is the restaurant’s top chef. Khunn calls New York City his home now. He’s been here for a long time and he doesn’t even think of ever leaving that exciting city.